First of all, apologies for my long absence from the blog. Many things have consumed my time and attention in the last few months, but now I hope to get back to posting on a regular basis. Today’s post comprises extracts from Sages, Saints and Arunachala Ramana by Mrs Feroze Taleyarkhan. This book is a primarily a memoir of her time with Ramana Maharshi and Ananda Mayi Ma. It was published by Orient Longmans in 1970 and has never been reprinted. Mrs Taleyarkhan, born in 1898, came from a rich Parsi family. 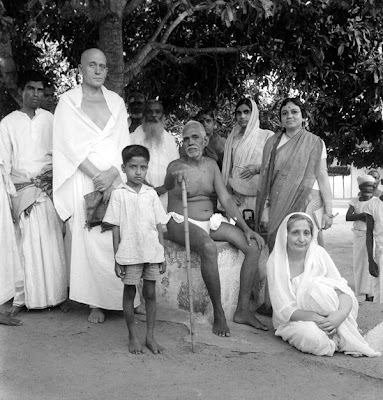 After she became a devotee of Bhagavan in the 1930s, she used her connections with her wealthy friends and community members to raise funds for various Ramanasramam building projects. Her book is, I regret to say, a very spiteful one since it details at length with the various feuds she had with the Ramanasramam management. I do not propose to air any of her grievances here. Instead, I will focus on her descriptions of events that may be of interest to fellow devotees. I have attempted to improve the English a little in some of the passages, and I have also censored out many of the malicious asides that litter her narrative. I do not recommend the book to anyone, but it does contain a few nuggets that are well worth preserving. I have added a few of my own editorial comments in italics. I knew that my people would not approve of these ‘wild cat’ schemes of mine. Nor would they approve of my visiting sadhus. So, on the pretext of visiting Madras, I managed to slip out of Bombay and reached Tiruvannamalai on November 9th, 1937 – a memorable day in my life. The witty station master called for a bullock cart and put me in it, saying that it was ‘the taxi’. For a mere three annas it dropped me at the ashram. In those days there was the old hall, the dining hall, a cowshed and a few other huts. There were no rooms for guests such as you find today. At the ashram office I was received kindly by the sarvadhikari and then escorted to a small, cage-like room that had none of the conveniences I had been accustomed to. I was anxious to see the Maharshi immediately, so I asked to be taken to the bathroom since I wanted to bathe before having his darshan. It was a shock to be told that there wasn’t one. I made a makeshift one out of my saris, had my bath, dressed, and left for the old hall where the benign Maharshi, seated on a couch, beckoned me to sit down. The lovely star-like, calm eyes greatly attracted me and looked at me with deep compassion. A little later I spoke to Bhagavan about the object of my visit, and I handed to Rajagopal [an attendant] the copy of the prospectus of the Home of Devotion I had brought with me for Bhagavan to read. He read it, re-read it, and then read it out to the people who were present in the old hall. Then he pointed me out as its sponsor in such a way that made me feel highly elated to think that even on the first day I had been able to get the blessings of the Maharshi. The lunch gong rang at 11 a.m. The few of us who were present trooped into the dining hall after Bhagavan. I was seated opposite him. Bhagavan was all solicitude for me. He paid great attention to what I was eating, and extended the same courtesy to the others who were eating there as well. As I sat there eating the lunch, I was touched by Bhagavan’s love and concern for me. This was the first occasion I felt that God can be love, only love, and nothing but love. The love that I subsequently came to feel for Bhagavan was prompted not because he was a jivanmukta, but because he represented to me the very embodiment of love in its finest, purest and noblest aspects. After the midday rest I came back to the hall at 2.30 p.m. The sarvadhikari sent for me at 4 p.m. to inform me that since ladies were not allowed to stay in the ashram at night, I must pack and be ready to go to town after dinner. I was shocked to discover that there were no facilities for women to stay overnight. The ashram room I had been offered had been very primitive, and I shuddered to think what might await me if I had to leave and find a place in town. I was protesting about this unfair arrangement to the sarvadhikari in the office when Mr Bose walked in. He remembered me from an earlier meeting in Bombay, although at the time I have to say that I didn’t remember him. When he asked me how long I was planning to stay in the ashram, I had to tell him that I was leaving that minute because I was not allowed to stay there at night. Mr Bose offered to accommodate me in his own house, which in those days consisted of only one room, a bathroom and a veranda. He let me occupy his own room while he made himself as comfortable as possible on the veranda. When I returned to the ashram, Bhagavan made kind enquiries about my accommodation. That evening, after I had been compelled to leave the ashram, Mr Bose spoke to me about his own experiences with Bhagavan. I spent three days with Bhagavan on this first visit and then returned to Bombay with a feeling of elation because I felt that my pet scheme, the Home of Devotion, would succeed. I gave the green signal to Shri Yogendra and Smt Sita Devi [the people who had suggested she seek Bhagavan’s blessings] to proceed with the scheme. It was in the year 1939 that I paid my second visit to Ramanashram. This time I came to fight with Maharshi. Between 1937 and 1939 I was at Bodh Gaya for some time, doing my sadhana. Later, during the same period, I went to Australia. On my return from Australia, I went to Tiruvannamalai, intending to take the swami to task for having failed me grievously over my project of a ‘Home of Devotion’ in Bombay. I was greatly upset over this failure, for I had thought to myself that I had secured the blessing of the Maharshi at Tiruvannamalai when I first came to see him in 1937. On reaching the ashram on this second visit, I was met at the gate by Bhagavan’s attendant Shri Rajagopal, a lively and jolly person. Recognising me at once, he asked me immediately what had happened to the project for which I had sought the blessing of Bhagavan during my earlier visit in 1937. My anger knew no bounds. I told him what I thought of ‘that old humbug’ who had misled me into thinking that the project had had his blessings, only to find within a few months that it had collapsed altogether. I told Rajagopal that I had come to take Bhagavan to task for failing me so grievously. My aggression somehow melted away when I found myself in Bhagavan’s presence again. Though I spent quite some time in the ashram in the presence of Bhagavan, it did not occur to me to raise the topic, let alone take the him to task. Among those who were present in the hall during this visit was Uma Devi, a Polish lady, who was telling Bhagavan that she had collected a sum of Rs 15,000 and a number of boxes of clothes which were being sent to refugees from Poland who had assembled at a camp in India. Although Bhagavan seemed uninterested, she went on repeating her achievements with, in my opinion, a view to draw Bhagavan’s approval for the work she had done. When Bhagavan had patiently heard the story for the third time, he slowly turned the revolving shelf near his couch and took out a copy of an issue of The Kalyana Kalpatura. He picked out a passage and asked that it be shown to Uma Devi. At this point I had been in Tiruvannamalai for some time, and although I had come with the purpose of complaining to Bhagavan, I had not yet found any opportunity to raise the subject. I was sitting next to Uma Devi, watching the interchange and thinking that it had nothing to do with me. But then Bhagavan smiled, looked at me, and said, ‘That is for you too’. I looked over Uma Devi’s shoulder to find out what message Bhagavan was sending to me. The meaning of that passage was utterly clear and definite for me. From that day on I felt that my place was at the feet of this Master, who, without a word said, could understand the workings of the human mind and find the answer to its troubles. From that moment on, Bhagavan’s infinite patience and grace guided me, not directly, but no less decisively and infallibly. I realised that I, who was full of passions such as anger and jealousy, could hardly have carried out such a project [The House of Devotion] through to a successful conclusion. One must first conquer oneself to be able to take on an onerous task such as the one I had planned. Had Bhagavan told me so in so many words, I am sure I would have flared up, even in his presence, and hurled, in a fit of temper, some words that I would in leisure regret. How gently, yet firmly and forcefully, he acted, and how great was his thoughtfulness for the welfare of the people who came to seek his help. He had, with no words of his own, conquered me completely. From that day on, I knew no Master who could hold me as he did. To this day I remain bound to his feet faster than one can be with hooks of steel. I am bound with bonds of love to him who was and is the personification of love in all its plenitude, grace and majesty. The decision to stay at Tiruvannamalai and certainly the decision to make it, and not Bombay, my home was not an easy one. During my second visit to the ashram I stayed for about three or four months and took up residence in the house of my friend, Mr Bose. Years earlier I had met him at Shri K. F. Nariman’s in Bombay, and Mr Bose had there sought my help in some of his ventures. During his frequent visits to Bombay he used to be my guest. I would go to the old hall to sit in Bhagavan’s presence to enjoy the deep ineffable peace radiating from him. I noticed that his powerful, bright and shining body sometimes seemed to tremble a bit, and then become immobile and motionless, as if he were in deep samadhi. When he emerged from it the same trembling motion would be noticed. I felt that the greatest power on earth was not with its kings and statesmen but with this man here whose only earthly possessions were the bamboo staff and kamandalu, lying beside him on the floor, and his loin cloth. This man had plunged into his inmost depths to find and be the truth that we are, which men of giant intellect may try to explain in learned ways. His love and humility were heroic. Utterly unassuming, he never tolerated any fuss being made about him. Gentle yet firm, his calm could never be disturbed. Pure in heart and mind, having realised the Self of all, there was no Guru or sishya for him. He had an equal regard for one and all. Sitting in the presence of such a man, thoughts of the fugitiveness and vanity of life as I had known, lived and suffered would pass across my mind. I felt that one and one thing alone was worth thirsting after in life: that was to know who was the ‘I’ we always refer to in all our thoughts, words and actions. To accomplish this it was my deep conviction that it was absolutely necessary to obtain the grace of the Guru. Wealth, relations and status did not count in the least. My appetite to know more of Bhagavan was considerably whetted by Shri Naina, whom I met on my first visit. I established a great and life-long bond with him in almost the first moment that I saw him. He and Viswanatha Swamy would spend the evenings with me at Mr Bose’s place and regale me with stories from Bhagavan’s life and of their own experiences with him. One such evening I saw on the Arunachala hill a vision of a blood-coloured heart and the planet Jupiter, both set against the background of the hill. It made me think of my birth-star, Jupiter. The vision was not visible to Naina. When I tried to call his attention to it, he tried to brush it off, saying that it was probably some fires lit by woodcutters on the hill. I could not believe that such brilliance, which was quite stationary and immobile, could proceed from any man-made fire. I watched fascinated by this vision from about 8 p.m. till 3 a.m. that night. Then, tired, I fell asleep and had a dream. The sky before me opened, and a flower-decked swing appeared out of it, with the Lord Siva seated on it. He had the tiger skin around his waist and the hooded cobra round his neck. Swinging three times, the Lord placed his feet on my forehead with each swing. On the third movement, when I asked who he was, he said he was Lord Siva. The following morning, when I was sitting in the hall, I had the sensation that Bhagavan was looking at me curiously, obliquely, from out of the corner of his eye, as if to say he was aware of my experience the previous night. That night, maybe around 1 or 2 a.m., I was asleep in my room in Mr Bose’s house. I dreamt I was quite alone with Bhagavan in the old hall, with my eyes closed in meditation. Bhagavan was leaning on his couch against the side pillow, out of which appeared a brilliant star that threw a soft, heavenly light on me. The light disappeared and I saw Lord Buddha dressed like a king, with all the kingly regalia and jewellery. He had a tiara on his head and was seated in Bhagavan’s usual position. After a few seconds the figure disappeared and was replaced by the figure of Shri Ramana. This gave me the assurance I needed to make up my mind that I should make a home in Tiruvannamalai and spend a few winter months here every year. It was said that Bhagavan would not permit a married woman to live away from her family and home and that he would not view with favour the idea of my building a residence for myself. I was very happy that day when he asked me as I entered the hall, ‘So, you are going to build yourself a house here’. My way of life and attitude to it, along with the yearnings of my heart, were in dissonance with that of all my relations. Treading the path I did, I was quite alone in my family. All the other members of my family followed worldly ways and ridiculed me for what I had chosen to do. Although they just about tolerated me, I was once the recipient of a ‘stinker’ of a letter from one of my sisters who, so I thought at the time, might have had a greater appreciation for my chosen life. I took that letter to Bhagavan. He remarked that if one member of a family chose to tread the path of spirituality, by that very act the rest of the family would derive immense benefit and be protected from evil. I informed my sister that far from railing at me for my ways, my family had every reason to thank me as they were being protected from unknown and unseen dangers. I was about this time oppressed with the thought of the lack of money for the ordinary comforts of life. My family, with a view to forcing me to return to their walk of life, had withheld from me all my personal property. I walked one day into the ashram, thinking I must tell Bhagavan of my dilemma. I felt it might, ultimately, oblige me to leave the ashram. I did not, however, want to tell Bhagavan in public. That day Bhagavan looked at me with such benign glances, I felt he knew my situation. As on the occasion with Uma Devi, Bhagavan offered me advice when he spoke to someone else in the hall. After he had said these words Bhagavan asked that his reply be translated for my benefit. I knew immediately that Bhagavan had, in his inimitable way, offered the solution for the dilemma posed in my mind. I made up my mind that it would be quite a wonderful sadhana for me. Sohrab’s birthday was on the 25th of July. That day I gave a party for my friends at my residence. Major Chadwick, Mr McIver, and Shri Devaraja Mudaliar were among those present. It was an enjoyable party. ‘Manage what?’ I asked in reply. He was astounded, and asked if I was off my head. He could not understand how any member of his family, particularly his mother, could voluntarily decide to be a beggar. The Taleyarkhans are a great and influential family, and he was quite upset that one of them would choose this option. On the day of his departure he asked if I would accompany him to Madras to see him off. With Bhagavan’s permission, I accompanied him. I was hoping that he would tell me of his reactions to the ashram and his impressions of Bhagavan. Up till the moment that the train was about to leave, he had not spoken a word. Without any further explanation he jumped on the train and returned home. Four days later a telegram arrived from my sister in Bombay, asking me for instructions for the disposal of my jewels and other valuables which had been handed over to her by my son. I asked for them to be sent to me through a friend to Madras. With Bhagavan’s permission, I went again to Madras, took charge of the valuables, sold a part of my jewellery for a few thousands and came back with the rest to the ashram. Thus did it please Bhagavan to put an end to my alarms on the material plane as well. My brother-in-law, Mr D’Mello, had returned earlier than he had anticipated from Ceylon and came to Tiruvannamalai with Rita. Both husband and wife were anxious to have darshan of Bhagavan. Entering the nirvana room, the couple made a low bow to Bhagavan. Rita took off her finger the diamond-studded engagement ring given to her by her husband, and also the jewel-studded bracelet on her wrist that contained medallions of Jesus Christ and several other saints. She laid them both on Bhagavan’s lap. Bhagavan examined them all carefully. He was greatly interested by the medallions and praised all the saints who were featured there. He put the ring on his finger for some time and then returned all the items to Rita. Husband and wife then both prostrated to Bhagavan to seek his blessings. My fears for the behaviour of this ardent Catholic couple in Bhagavan’s presence were quite groundless. Such is the overpowering grace of Bhagavan. Though we all had family relations of our own, all the devotees seemed to feel that they were members of Bhagavan’s own family. A question that was often discussed in the ashram, among visitors and residents, was who constituted Bhagavan’s family: blood relations or others. To these questions Bhagavan never gave any answer. On one occasion, though, he made an exception to say that a jivanmukta’s family consists of those disciples who follow the jivanmukta’s tenets, practise them, and bring their sadhana to a successful conclusion, becoming themselves jivanmuktas. Not one of us can stand this test. So vexed was I by this question I found occasion to discuss it with Shri Rajaji [Rajagopalachari] and Dr S. Radhakrishnan. They both confirmed that this view alone was right and that we would be pulling Bhagavan down from his high pedestal, besides doing him a great injustice, if we named anybody else a member of Bhagavan’s family. One of the four Sankaracharyas to whom I paid my respects also confirmed this view, almost in the same terms. He told me that only such a one who has followed the precepts and practised the sadhana laid down by a jivanmukta of the high status of Bhagavan could ever claim to be a member of his family. I am uncertain what year it was, perhaps 1947. I was having pains in my abdomen which did not respond to the homoeopathic remedies administered by my friend Mr Cohen. So, with Bhagavan’s permission, I went to Bangalore for examination and treatment at the Curzon hospital there. X-ray diagnosis revealed a big lump on the left side. My friends, Doctors Wanless and Vail, had warned me earlier that the disease was likely to recur and spread. The doctors at this hospital in Bangalore did not, however, take me into their confidence in the matter of their diagnosis, but were arranging amongst themselves privately to perform an operation for the removal of this growth. They spoke to my friend Shri Mizra Raza about this, but not to me. Around that time a letter from Shri Rajaji, then Governor-General, was redirected to me from Tiruvannamalai. In my reply I informed him of my condition. So kind and solicitous of my welfare was Shri Rajaji that even when he occupied the highest position in India, he found time to write to the doctors in charge to bestow close attention on me as if he himself were the patient. The letter came to the notice of the Dewan of Mysore, Sir A. Ramaswami Mudaliar, who decided to visit me in the hospital. These factors made the doctors evince deep interest in my case. I was alone; none of my relatives were at my bedside. The operation would be the eighth of a series of operations I had undergone in my life. But the doctors encouraged me and made me feel quite at home in the hospital. Suspecting that I might have to undergo this operation, I wrote to Bhagavan, praying to him to grant that I might close my eyes in peace [die] rather than undergo this eighth operation. When this letter reached Bhagavan, he read it as usual in the old hall, and there he made kind mention of me to the people present. Following Bhagavan’s directions, Mauni – bless his soul – wrote to ask me to come back to Tiruvannamalai, assuring me that things would be all right. The Dewan and the doctors all assured me that the operation that was scheduled to take place within the next two days would relieve me of my pain, and that I would go back fit and healthy. I told him that I had decided against the operation, and then showed them the photo of Bhagavan which was on my table near the bed. He, I said, was my doctor and in accordance with his instructions, I would be returning to Tiruvannamalai without undergoing the operation. Dear reader, believe me that I, who for ten days earlier, could not retain any food, that day enjoyed toast and scrambled eggs without pain or discomfort. That evening I attended a cinema show with the matron of the hospital. When I approached the chief surgeon to take leave of him, he was pretty incredulous. He again had x-ray photos taken of me, but to his astonishment they did not show the growth where it had been previously located. Assuring the doctors that I would place myself at their disposal for treatment in case of the recurrence of the trouble, I returned to the ashram. Bhagavan’s gracious smile on the day I returned to the ashram is still a priceless treasure in my memory. Nearly two decades have passed since then, and I have not had any recurrence of this particular trouble so far. Miraculous cures like mine by Bhagavan, may I say in all humility, were not uncommon. In the mid-1940s a few motion picture shots of Bhagavan’s life were made at my request by Shri Raja Reddy, a wealthy landlord of Hyderabad. I also desired to make a recording of the voice of Bhagavan, so sweet and moving, as though it came out from heaven, in its most gracious mood. I told Bhagavan that I intended to make a ‘talkie’ of him. He just smiled as if to tell me that he knew it would not be permitted by the ashram office. My desire to make this happen was facilitated a short time later by a fortuitous meeting. Anantanarayanan, wife of Shri M. Anantanarayanan, who retired recently from the High Court of Madras, wanted me to go with her to a local travelling cinema to witness the life of a saint. The theatre was near my house. Some twenty-five of us went to see the film. During the interval Mr Mani, the manager of the theatre, introduced himself to me and asked to be allowed to meet me at my residence the next day. During his visit he told me that he would be obliged if I would put in a word for him with the district officials for an extension of his licence for three months to enable him to take advantage of the big crowds the great festival of Kartikai Deepam would be attracting to Tiruvannamalai. I agreed, but in return I asked him if he would help present the film shows in the ashram on the occasion of the Jubilee. He was the manager, rather than the owner of the cinema, so his bosses had to be consulted. They came from Madras on a subsequent Sunday and agreed to lend their equipment, costing over a hundred thousand rupees. I took these gentlemen to Bhagavan and prayed to him to bestow his grace on them. I also told him of my plans for the Jubilee. Bhagavan remarked sweetly, ‘Oh, so you are going to show films,’ and discussed the plans for them with us. The task of setting up the machinery was a difficult one, and it took us a fortnight to rig up a theatre in the dining hall, which was hardly suited for that purpose. But somehow this was done and the hall was ready for a film show. The show was a grand success, thanks to the grace of Bhagavan. The first film shown was Ram Rajya. This was followed by a film about Tukaram, Dnyaneshwar, The Vatican, Charlie Chaplin and some others, making eight films in all. The film Bhakta Chukka was shown one day. In this film a man used to go to a female singer, and everyone knew that his character was bad. Later, some miracle happened and he entirely changed and became a great saint. Some widowed women of the ashram watched the film. The next day they told Swami Niranjanananda that I was spoiling Bhagavan’s character by showing such films on the premises. Swami called me into the office the next day to tell me to stop the performances as all these women were complaining. I went straight to Bhagavan. I informed him that these women were saying that I was spoiling his character by showing such bad films. Immediately, Bhagavan sent for the life of the saint and started reading it, and showed them how human beings can change in a minute. Hard coconut shells are generally used in households as fuel, and the ashes sometimes used for tooth powder. Bhagavan had other uses to put them to. He would take immense pains to clean off the strands of fibre from the shells, scrape and polish the surface inside and out, and make ladles out of them for use in the kitchen, and for other purposes as well. I saw Bhagavan at work with two shells, and a few days later found them turned into very beautiful cups. This type of work was almost a hobby, and a passionate one, with Bhagavan. One of these shells was big and the other somewhat smaller. He took three or four days to polish these cups to his satisfaction. As I was watching him, I was praying to have one. Sensing my desire to have it, he passed the smaller one on to me. I was thinking, however, of the other one too, and although I never gave expression to my wish, he called, ‘Ho, come here, take this,’ and gave me the other one as well. These are possessions which I am never tired of showing to all my friends as the handiwork of Bhagavan for whom no work was too small. For him all work was sacred. Close attention to detail, absence of hurry, perfection in every task attempted, and maximum utilisation of every bit of an article characterised Bhagavan. In the final year of Bhagavan’s life I made two long cushions for Bhagavan to rest the arm that was affected by the cancer. After one of the operations, the wound opened and the cushions became soaked with blood. On this occasion Bhagavan, in the presence of his attendants Shri Rangaswami and Shri Sathyananda, gave me those two cushions as his gift to me. I replaced them with fresh ones the next day. The original cushions I esteem as precious relics and today they are amongst my most prized possessions. In my travels around the world I have seen and I have also heard that places associated with the great men of the several countries I have visited have been preserved, in some cases as national memorials, and that these countries have honoured their great men in other ways as well. The thought of these spots dedicated to the memory of the great of the land came upon me one evening as I was sitting idly with Viswanatha Swami on the parapet wall of the well at Ramanasramam. After making some enquiries, I was told that Bhagavan had been born in the village of Tiruchuli in the Ramanathapuram District, but that no one nowadays knew who the owner was, or who was currently in possession of the house. I felt it was a shame that none of Bhagavan’s devotees had ever thought of Bhagavan’s birthplace. My restless energy made me pursue these enquiries. I resolved that the birthplace should be purchased and preserved as a memorial to Bhagavan, as I considered him to be the greatest of the great. Negotiations were begun for the purchase of the house, but as soon as it became known that the house was to be purchased by a Bombay lady, the price, as usual, was increased. However, thanks to the indefatigable efforts of an old lawyer-devotee, Shri Ranganathan, the price was settled at a reasonable figure and the sale put through. My friends, Shri Pestonjee Mahaluxmiwalla and Shri Govindram Seksaria, both personally gave me gifts of Rs 2,500 as a contribution towards the purchase. The house was in bad repair, but soon was made suitable for the purpose for which it was intended. The sarvadhikari was in a great hurry to perform the house-warming ceremony. He approached Bhagavan, who asked him if he was planning to perform the ceremony without me. I was then in Bombay. The sarvadhikari asked me to return to the ashram, since he was eager to complete the ceremonies. On my return, a party of about thirty of us left for Tiruchuli. On the way, I stayed at Madurai with Shri R. M. Mahadevan, then District Superintendent of Police there. He made all arrangements for our onward journey to and from Tiruchuli. The Dewan of Ramanathapuram was present with us on the occasion of the ceremony. It was performed in a fitting manner and was enjoyed greatly by everyone present. Since our party was a large one, while we were in Madurai we were accommodated in several houses. During our visit we went to see the famous Shri Meenakshi Temple. On the way there the lawyer Shri Ranganathan pointed out to me the house in Chokkappa Naicker Street where Bhagavan had lived as a student and where he attained that illumination which turned the student Venkataraman into the latter-day Bhagavan Ramana. When I saw the house, I again felt the urge that this house too should be bought and preserved as a memorial to Bhagavan. Shri Ranganathan was again helpful in arranging for the purchase. The funds were provided at my request by Shri Raja Reddy, a wealthy zamindar who had been my guest at the ashram, and who had made a few motion-picture shots of Bhagavan. The house is known as ‘Shri Ramana Mandiram’ and the house at Tiruchuli as ‘Shri Sundara Mandiram’, in memory and in honour of Shri Sundaram Iyer, Bhagavan’s father. Although I had seen on the person of Bhagavan the marks of insect bites suffered by him during a period before I came to the ashram, for quite a long while my curiosity had not been sufficiently excited to enquire how Bhagavan came by them. One day, in a reply to a question put by him, Bhagavan said that they were the legacy of the days he had spent at the Patala Lingam Shrine, very early in his life here. Bhagavan desired me to see the place. Because I had not seen it before, one evening he asked Naina to take me to the Shri Arunachaleswarar Temple. During our visit Naina pointed to a part of the thousand-pillared mantapam as the place where the shrine referred to by Bhagavan was. We could hardly approach the place, so dirty it was. It was being used as a public lavatory rather than a shrine. This news saddened Bhagavan. I felt that must be the reason for Bhagavan having chosen that spot for his austerities and something impelled me to say, ‘I will do up the shrine and see that the place is put to its proper purpose’. I reaffirmed my intention, although I did not know then what I had undertaken. I decided to approach Shri Kailoo Parekh, who was almost a son to me, and for this purpose left for Madras in the company of Shri Narayana Iyer, Sub-registrar. When I met Shri Kailoo Parekh, he asked me to be ready to accompany him that afternoon when he would take me to the right person to help me. I did not know whom or what he had in mind. I soon found myself at the gate of a residence bearing the nameplate Shri Tarapore. I immediately wanted to leave as I did not want to meet any members of my [Parsi] community. However, it was too late for any protest as I soon found myself at the portico being welcomed by Mrs Tarapore – Dhanmai – and her beautiful daughter Dina Mai. They put me at ease at once, and I overcame the sense of uneasiness I had felt on entering their building. A sumptuous tea was laid out for us, after which Kailoo coolly asked me to hand over the plans to Shri Tarapore. I had had them prepared in Tiruvannamalai by the stapathi who was engaged in the construction of the Shri Mathrubhuteswara Temple in the ashram. I did not know at the time that Shri Tarapore was himself an architect of high repute, or that he was to play a great and important role in my life thereafter, providing me a home, love and care such as I have never enjoyed, or that it was a day of destiny for me. That is how it was to be, and I took it that it was so because of Bhagavan’s grace. Shri Tarapore took the plans and asked me to meet him at his office the next day when he put some questions. Then he simply told me to leave the whole thing to him, adding that whatever was required would be done. I wrote to Bhagavan a long letter, telling him of my good luck, saying that Shri Tarapore had undertaken the entire responsibility for the construction of the shrine of the Patala Lingam. Bhagavan expressed his satisfaction with what I had arranged. Shri Tarapore and his engineers came a week later, inspected the place, and set to work on the construction of the temple. Removing the accumulated dirt itself was something of a problem. As was usual with him, Bhagavan evinced considerable interest. I reported daily to him on the progress of the scheme. Experts had been engaged by Shri Tarapore on the work, and he and his family would often come to Tiruvannamalai to inspect the progress of the work and to satisfy themselves that it was being executed properly. On all these occasions they never failed to pay their respects to Bhagavan. As the temple was nearing completion, I told Bhagavan that I was approaching Shri Rajaji, then Governor of Bengal, to perform the opening ceremony. With Bhagavan’s blessings I wrote and Shri Rajaji readily agreed to my request. I had undertaken the task of cleaning up the two big tanks in the temple premises, the waters of which were stinking from the accumulated moss and dirt. I may here be permitted to digress to an incident which happened a few years earlier. At the time I was so much absorbed in my Lord Bhagavan, I had no other thought. Suddenly someone asked about the Arunachala Temple. I had never even been to the temple, so I asked Bhagavan about it. ‘You must go and see it,’ he replied, and he asked Naina to take me. Hearing this, all the other devotees also wanted to accompany us. So, one night, all of us went. As we were entering a sepoy stopped Naina and started a discussion with him. Somehow, I felt that this was something about me, so I enquired what was happening. Dear Naina did not want to embarrass me, but he had to tell me that they were taking me to be a non-Hindu. At that time non-Hindus were not allowed into the temple. Immediately I went and saw the Executive Officer, who understood me and took us all inside. When I went to Mother Parvati in the temple, I nearly cried and said, ‘O Ma, if you are a real mother, then see that today’s insult should give me the chance to serve you in such a way that one day my name will be in this temple’. I was not aware of what I was saying, but lo and behold, five years later, I took up the Patala Lingam work, which I shall ever cherish as the great Mother’s answer to my prayer. The task had expanded from renovating the shrine to a general spring clean of the whole temple. I brought pumps from Polur and Vellore and made sure that both the temple tanks received a long overdue spring cleaning. I saw to it that the entire premises of the temple were made spick and span for the function. The Executive Officer of the temple was of immense help to me during these activities. The arrangements at Tiruvannamalai were vigorously pushed through. I saw to it personally that all the stations on the railway line from Madras to Tiruvannamalai received a long overdue coat of whitewash and that the houses lining the streets of the town of Tiruvannamalai along which Shri Rajaji was to pass were also whitewashed and gaily decorated. The town of Tiruvannamalai was also brilliantly lit up so that Shri Rajaji could have some idea of the reception planned for him from his special train itself. On the day of the ceremony Shri Rajaji drove in an open car [from the station] to the well-decorated temple where he performed the opening of the newly renovated temple of Shri Patala Lingam. On entering, he asked Shri Tarapore to put up a plaque in English and Tamil to commemorate the occasion, which was done subsequently. He went down the steps and graciously prostrated to the lingam there. [There is an account of the restoration and opening of the Patala Lingam Shrine in Letters from Sri Ramanasramam, 10th May 1949. Shri Ramana Maharshi has kept India’s spiritual glory alive in our generation. He had in his own way made the name of India respected by wise and enlightened men spread all over the world, even as Shri Ramakrishna Paramahamsa and other saints did in former times. Ramana Maharshi’s meditations took early shape in this temple. Let us tender our tribute of reverence and homage to the enlightened soul and may his prayers, on our behalf, bear fruit. Let us be worthy of him. The sentiments expressed in the speech, however, were not enough to persuade Rajaji that he should go to the ashram and pay his respects to Bhagavan in person. Although almost everyone else in his party made a visit to Ramanasramam, Rajaji stayed in his special train and ate all his meals there. In the Letters from Sri Ramanasramam account he sent his apologies to the ashram, saying that he had ‘some urgent work’ to attend to. That evening the A.I.R. [All-India Radio] broadcast a recording of the function at the temple which Bhagavan heard with rapt attention. When the broadcast was over, Bhagavan said, with a sigh of relief, that for three or four days he had been moving in dread lest I should pick him up and take him to the function. What an opportunity I had missed, I shouted, but Bhagavan motioned me kindly to resume my seat and said he was much relieved. A little later someone informed Bhagavan that a fee was being levied for admission into the newly constructed temple. Bhagavan asked me if it was true, and pointed out the informant, who affirmed it. Immediately, I wrote a strong letter to the Executive Officer to stop that practice. Bhagavan said that no levy ought to be made for entry into the temple. Bhagavan bore his pain with exceptional patience. It must have been terrible. The doctors could do little to mitigate it. Mauni [Swami] and a few others prayed to Bhagavan himself to ask him if anything could be done. The night before the fourth operation, while the ashram people were in dinner, I went to the new hall where Sathyananda and Rangaswami were massaging Bhagavan’s back. At this I knelt down crying and placed my head on his knees. Bhagavan touched my head three times, saying these words each time he did. Then he gave me the Kashmir shawl he had about him – yet another precious relic of Bhagavan that is treasured by me. On 12th April 1950 Rangaswami came to my place at 8 p.m., while Mr Cohen and I were having our dinner. He brought us bad news. Every word of Bhagavan’s prediction came true. Three of the attendants, including Rangaswami, were asked to leave the ashram after Bhagavan passed away, even though they wanted to stay. Rangaswami died in his village a few months later. For over a week after mahanirvana, I was quite desolate at missing the physical presence of Bhagavan, and I did not know quite what to do. Between tears, thoughts of ending this life often came to my mind. My husband too was no more then, and Bombay held no fascination for me. Then, one afternoon, as I lay asleep, I had a dream. I was standing on the verandah of my house. I saw Bhagavan come down the Arunachala hill with his walking stick and kamandalu and enter the verandah of my house by the side door. He came up to me and asked, ‘Why are you weeping?’ Tears welled up in my eyes. I said I missed Bhagavan too deeply for words. Bhagavan bade me wipe my tears, assuring me he was always with me here. He went out by the door opposite, crossing the bodies of three or four people who were soundly asleep on the floor, whose identity to this day escapes me. This dream is still vivid in my memory, and were I an artist I would have drawn a picture of the scene. Bhagavan almost seemed to tell me that my place was at his ashram and that my services in the interests of the ashram should continue. I have read Mrs Taleyarkhans book. It's a very interesting narrative. You have have to remember there were a number of disgruntled devotees over the years. The Sarvadikari may have been to blame. Nevertheless her devotion to Ramana Maharshi was sincere. How could one not be devoted to Ramana! Thanks David for giving another pearl to us. These articles of historical background are truly valuable to all devotees of Sri Bhagavan. Will your account about Maurice appear sometime? The Maurice Frydman project turned into a big one. I still have a lot of material to collect and process. Glad that you're back. Thanks for this great post. There's a typo you might want to correct - 'she personally supervised the renovation of the Patala Lingam Shrine where Bhagavan stayed briefly in the 1980s' it should be 1890s? I can't wait to get my hands on the Maurice Frydman book/s you're working on. Let us know if we could pitch in to cover some of the publication costs. Thanks for pointing out the incorrect date. I have changed it. Reading your new post after a long break was like regaining the hidden Arunachala-Ramana Consciousness. I believe, Mother Teresa truly fits the above description. Thank you very much for the post. With Regards. Sankar Ganesh. I was under the impression that "Naina" or "Nayana" was used to address Shri Kavyakantha Ganapathi Shastri. Didn't realize that it applied to Shri Venkataramiah also. I am not able to see the photo of Mrs Taleyarkhan with Bhagawan, that is uploaded in this blog. Can you please take a look? Thanks for this great collection! You seem to come up with such Gems everytime. Thanks for the tip. I don't why the photo disappeared, but I have reloaded it. Another illuminating story from a devotee i had known nothing about - thanks David. Ms Taleyarkhan achieved some great things for the Ashram and on Ramana's behalf by this account. It is strange that the Ashram management were used to enforce the more problematic instructions from Bhagavan, i wonder why recording his voice was taboo? Could someone tell us if Feroze's house is still standing and occupied? And what might have become of the gifts that she was given by Bhagavan? There are some more devotees of Bhagavan of whom little is known. Do you know anything about Bose - the Bengali devotee ? When I went to TV'Malai, I saw from outside a house called Mahasthan. I believe that this was called Bose compound during Bhagavan's days. Any idea who lives there now ? Another Bengali devotee of whom very little is known is someone called Mazumdar (?). But he/she (?) must have been a longstanding devotee for he accompanied the Kaviraj who came from Calcutta to attend to Bhagavan during his final illness. Only you can share such a gem of a summary of Mrs Taleyarkhan's experiences and her contribution. When I visited Mrs Taleyarkhan in the 1970s, she showed me all the items listed in this article. They were all prominently displayed in her puja room. There was a big dispute over her property when she died since several people claimed that she had left it to them. I don't know who finally won. The building is still standing, but it is not in good repair. I don't know what happened to all the items she received from Bhagavan. I read the account about Mrs.F.T. in the mind and found the Self! renovation work of Patala Lingam. You have given more details. and a fewer are chosen!" you mention that you had met Feroza in the 70s. I noticed on your web page that you are about 56 years old ( just a year younger to me ). You must have been in your twenties then. Is there some place where we can read about how you were drawn to Bhagwan and Arunachala and how it was that you decided to stay on ? would you mind sharing some of your personal experiences with us ? Davis, a mention is made of Mrs Taleyarkan's sister Rita D'Mello visiting in the late 1940s -- since it is mentioned that they were devout catholics, I at once wondered if they were in any relation to Anthony D'Mello, SJ (usually spelled "de Mello"? David (spelled your name right that time!) you mentioned Ramana never allowed voice recordings to be made. It would seem logical, considering that he often stressed silent teaching -- but did he ever give any reason, himself? I've always suspected it was because it added to the mystique that draws people in down through the ages. Maybe if there was footage of him, it would somehow trivialize. I don't think I was clear -- there are many photographs and even some film footage of Ramana and it can hardly be said that they have in anyway trivialized his teaching -- on the contrary! My understanding is that Ramana expressly asked that sound recordings not be made and I wondered if anyone had asked why. There ist an interview with Annamala Swami as of November 1989. I translated it into German but I have forgotten from where the original source is (perhaps David Godman knows this). On day Annamalai Swami wanted to see a movie about the life of Bhagavan. Bhagavan "wasn't amused" and said with a stern voice: "So you have come to see this shadow Bhagavan. The meaning of this is that you don't longer carry the true Bhagavan in your heart." Certainly this is true for voice recodings too. As long as we carry pictures of God within us instead of the one "pictureless picture" we cannot understand. This is the reason why our modern times - crazy about pictures - is contantly living in a stream of senseless pictures and sounds being nothing else but a masturbation with senseless thoughts. Her infidelity made her husband so furious that she escaped his wrath by taking shelter at Ramana's place. The narrative is deeply moving .What a great devotee was Mrs Taleyarkhan. But why the two personal attendants of Bhagwan were asked to leave the Asramam after Bhagwans departure. I heard that even Mouni Swamy who served Bhagawan with such immense devotion was asked to quit the asramam by the Sarvaddhikari. Any reason ? Amazing account of a great shishya. The love and affection and complete surrender of this shishya reminds one of Radha and SriKrishna. Her faith in Bhagawan is seen in the fruition of her sankalpas. Money came in whenever required for whatever task she took up. Divine. Thanks for the beautiful post.